Posted on 25, March 2016 by EuropaWire PR Editors | This entry was posted in Automotive, Finland, Greece, Technology, Transportation & Logistics and tagged fixed pitch propellers, Greece based shipping fleet operator, TMS Tankers, vessels, Wärtsilä. Bookmark the permalink. HELSINKI, 25-Mar-2016 — /EuropaWire/ — TMS Tankers Ltd, one of the largest Greece based shipping fleet operators, has selected Wärtsilä fixed pitch propellers (FPPs) for its new vessels under construction in China. The order was placed with Wärtsilä’s joint venture company in China, Wärtsilä CME Zhenjiang Propeller Co Ltd (WCME), in December 2015. Other leading Greek shipping companies have also recently opted for Wärtsilä FPPs. The contract covers the propellers for four Aframax tankers under construction at the Hantong Ship Heavy Industry yard. The Wärtsilä FPPs will be fitted with the company’s EnergoProFin solution, a propeller cap with fins that rotates together with the propeller to produce fuel savings of up to 5 percent. The Wärtsilä EnergoProFin has also been a popular retrofit solution to improve the fuel efficiency of many vessels already in service. Wärtsilä has earlier supplied FPPs and other products for TMS Tankers and its parent company’s vessels. The efficiency of the propellers is an important part of a ship’s overall propulsion efficiency. For this reason, TMS Tankers’ experience and satisfaction with Wärtsilä’s offering was cited as being a key factor in the award of this contract. “Efficiency and quality are the basic reasons behind the success of Wärtsilä FPPs, especially when supplemented by the EnergoProFin. We place great value on being selected by this large and successful shipping company, which is an endorsement of Wärtsilä’s propeller technology and evidence that fuel efficiency is still of great importance, even with the current low fuel prices,” says Arto Lehtinen, Vice President, Propulsion, Wärtsilä Marine Solutions. Wärtsilä Fixed Pitch Propellers are based on OPTI Design methodology, which ensures optimum performance and minimum levels of noise and vibration. The result is a robust propulsion solution covering the full range of ship operating conditions, and reduced operating costs thanks to the highly efficient hydrodynamic optimised propeller blades. Wärtsilä EnergoProFin serves to improve propulsion performance by weakening the hub vortex. It is tailored to the specifics of the individual propeller, and can be installed quickly and easily. The resulting improvements to overall fuel efficiency mean that the payback time can be as short as a few months only. 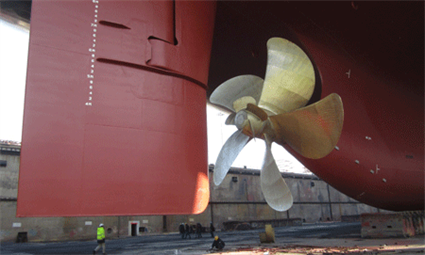 Caption: A Wärtsilä Fixed Pitch Propeller fitted with the EnergoProFin.